This week for Best Book Ever, I wanted to talk about books that don't always get a lot of love in the blogging world: the classics. We spend a lot of time talking about hot new books, but there are books that have endured for generations. Check out our selections and let us know what you think in the comments. Oh, the classics... I actually love them. I try to squeeze in at least one (goal is two) a year, and I don't flinch from the big fat ones. My goal this summer is Les Miserables, but for BBE this week I'd like to recommend A Tale of Two Cities. Not only is Charles Dickens an amazing writer, he's damn funny. I LOL'd at more than one point while reading it. Plus, nothing makes you look classier at the swimming pool than a musty paperback the width of your hand. The thing about classics is that we read many of them before we're really ready for them, since they're forced upon us in school; or at the very least, if we come back to them when we're older, we can see them in an entirely different light. For instance, I read Animal Farm by George Orwell when I was in the 5th or 6th grade, at which point it seemed like a fantasy novel with talking animals. Sure, they taught us about how it's a political book using satire, symbolism, and metaphor to make a very important point about government, propaganda, and how absolute power corrupts absolutely, but all I got out of it is "four legs good, two legs baaaad." Okay, I was probably a little smarter than that, but really, it was fantasy. Talking animals! I knew at the time that it was dark, but not quite how dark, and in many ways, I sort of misunderstood it all. 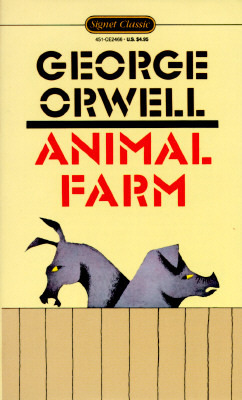 The reason it's so remarkable, for me anyhow, is that for our class project, I decided to write a sequel to Animal Farm. Right. I wrote Animal Farm fan fiction for my class project. I called it Animal Farm Revisited (clever, no?) and even drew a cover for it that riffed on the cover of our classroom edition (Signet Classics, 1986), showing the fence cracked down the middle (symbolism, I mastered it! ), and I think the pig was wearing a hat. It was like 20 handwritten pages on college-ruled paper, and I basically wrote it to retcon in a happy ending. Snowball came back from where he'd been hiding and overthrew Napoleon, and I think even the dead horse somehow reappeared because it was all some kind of trick. My teacher loved it so much she made me read the whole thing to the class, thereby giving me the impression from early on that I could write. So there you have it: My first serious attempt at fiction writing and my first group reading. And I'm totally going to reread Animal Farm and my unauthorized sequel to see how they hold up after all these years. Anne of Green Gables by Lucy Maud Montgomery was one of the first major book series that I ever read and truly fell in love with after just a few chapters in. Along with the series came the highly acclaimed movie series, that sealed the deal for me, as one of the best classics ever! This one took some thought for me. 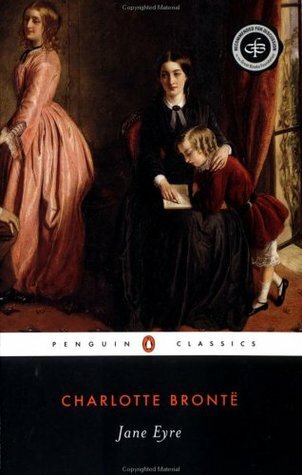 When I think of classics that I love, three books immediately come to mind- Pride and Prejudice, Emma, and Jane Eyre. But I don't want to talk about any of those books- they are so obvious! 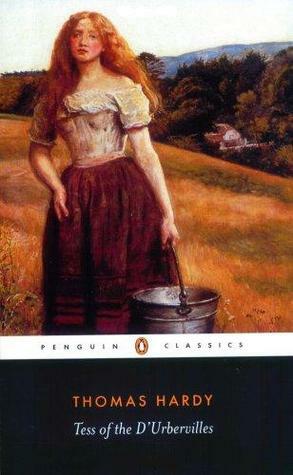 My pick for this week is Tess of the D'Urbervilles. Thomas Hardy wrote the ultimate of soap operas. Poor Tess- she is seduced by a man and then left high and dry after her baby dies and is left shamed. Her parents just consider her a pack mule. When she finally finds a good honest man to love her- he leaves her after finding out all of the skeletons in her closet. Tess is a fantastic classic (but one that requires commitment- it is LONG)! Go ahead and share your favorites in the comments! If you're interested in participating in Best Book Ever, let us know! Just leave us a comment or send an email to oneminutebooks at gmail and we'll get you set up! I loooove Jane Eyre! I will never grow tired of re-reading it :) Her and Rochester are perfect! 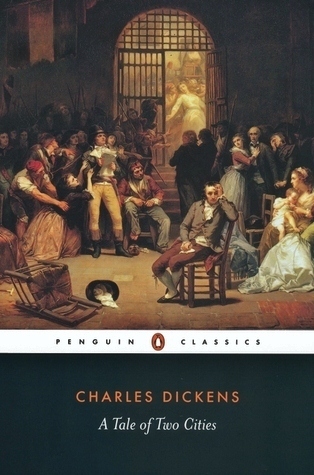 I've read some of Dickens' novels, but not yet A Tale of Two Cities. I really want to get around to it this year! Tess was really hard to read for me. I hurt for her, but I also wanted to hit her and pretty much everyone else. And it was so long and depressing. Much like Jude the Obscure. I think I just don't like Hardy's prose (his poetry is fine). I wasn't organized enough to add in my own thoughts, but other than To Kill a Mockingbird, my other favorite "classics" definitely leaned more towards more serious fare: Fahrenheit 451, Slaughterhouse-Five, Catch-22, Animal Farm. Like E.C. Myers pointed out, kids are often asked to read what we think of as the classics way before we can always completely get what they're about. I've been revisiting some of these books as an adult and I see them in a whole new light now, and understand some subtleties much better than I did as a kid. Also, I totally wrote teacher-sanctioned fan fiction/fix-it endings for classics all the time in middle school and high school! I went through a Joseph Heller/ Kurt Vonnegut phase my senior year of high school. Now I look back. I don't get how I liked them. LOL. Hello, I know it has been about two years since this post went up, but I just came across it and wanted to put in my pick for best classic. Mine is a little different and probably does not come up in most conversations, but I believe it is very underrated and deserves more discussion. Ever since I read Jules Verne's Around the World in 80 Days, I have not stopped reading classics to find another that gives me as much excitement. This book satisfies my wanderlust every time I read it and gives me adventure in my every-day monotony. I really think this book is great for kindred spirits looking for something different and lively. Other classics that don't come up as often and are close to my pick are Treasure Island, Alice's Adventures in Wonderland, Chronicles of Narnia: Voyage of the Dawn Treader and The Voyages of Doctor Dolittle.